Muscle Man was on the way home from Eastern WA so I had a little time to spare to get in a run. Buddy Tammy agreed to meet after Little Stud #2 was done napping. 3:30Pm and 85', GULP!! That is HOT for us WA natives. I packed apples, cheese puffs, extra sippy cups, toys, etc.. anything the Little Studs would need for about an hour. I wore my Nathan Speed 2 Fuel belt, thank goodness I was THIRSTY. The heat and pushing the stroller combined for a tough few miles...but what I did not realize was how FAST Tammy was going.. 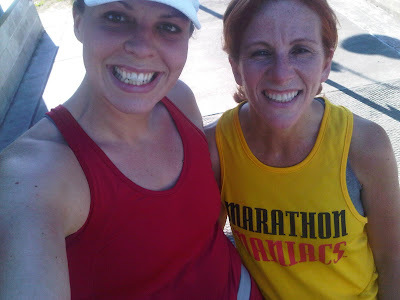 This lady is training to BQ at the Victoria Marathon in October and she is a speedy machine. Check out these splits with 90++ pounds of kids and a double jogger.. I had to walk, the resistance and heat was really getting to me. My eating, sleep and running schedule has been so OFF and my body was fighting back. I was happy to have Tammy along to take my mind off the fatigue. The boys were great despite a couple outbursts, I packed everything they needed, SCORE MOM POINTS!! Tammy helped push for a bit, which was nice.... I am VERY READY to get back to Kiddo free long runs. Running with them is much better than the alternative, not running, so I made the most of it. Dripping in sweat I called it a day at 5.5 and we ended with a brisk walk, 6 miles total of running/walking. Thanks Tammy for a GREAT run!! You are a MANIAC!! Man, you girls are cruisin with a jogging stroller! Great run! That is a FAST run with a stroller full of little boys! Woah! That's cardio AND weight training! wow that is a seriously inspiring time with or without a jogger!! Just think how rockin' fast you'll be when you can get out for a solo run! Totally cool that you can run with a bud and go that fast! great pic! you are definitely a super mom for getting through that run pushing your boys! And what a great friend to help with the chore! I'm sure you'll be happy to have your hubby back, for more than just the fact that you'll get to run sans jogging stroller again! Nice job! I couldn't imagine pushing that much weight, but you're probably right - it's better than not running! Nice cardio and strength workout there! You were crusing with that double jogger! WOW! Isn't great to run with a speed-speedster every once in a while. I used to love running a mile or two with Hubbs (pre-knee injury) because he was so fast in the short distance that I struggled to keep up. It always felt like it "reset" my running pace for the next solo runs. I wonder if the same will happen for you. I hope everything is going well, or better or whatever the "right" word is. Still praying for your family. Awesome job with the stroller and the heat. Sounds like the company was just what you needed! Those are some SPEEDY splits with the stroller! Way to go, Mama~! Yay for hubs coming home!! Man, I can't even run that fast sans-kids. Way to go! Way to be prepared and conquer a challenging, hot and fast run!! That's SO amazing! Well done running with the kids! It must be tough and annoying at times to pushing so much weight but at least you get to run!